But I sure can't find it. It is supposed to be 80 degrees here today. Yesterday was a high of 75. I ran a half-marathon and was over-heating before I even crossed the start line. 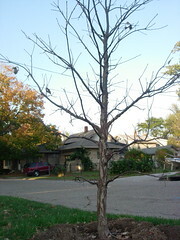 My tree may have no leaves, but that is more because it's brand new (two weeks old in my yard) and a storm knocked all the leaves off earlier this week. My neighbors have their Halloween decorations up, but I'm having a hard time believing it's fall. I'm going to buy some fall bulbs for the base of my new tree, maybe that will make it more like fall?